For many people, holidays are a day for eating out and celebrating at a restaurant with a fine meal. In my family, though, we've always marked special occasions with home-cooked meals, from elegant spreads to simple dishes that were cooked with more love than with skill. And Mother's Day has been no exception to this tradition. Back when my siblings and I were still pretty young, we'd serve Mom breakfast in bed. To us, the idea of breakfast in bed seemed exotically luxurious, and we wanted to indulge our mother with the best of the best, of course! I remember my brother making French toast one year, and there were a number of years when I made heart-shaped cranberry scones for this ritual meal. But in reality, I think it was always awkward for our energetic Mom to be confined to bed nibbling breakfast from a tray while the rest of us sat ranged about her on the bed. These days, much to everyone's benefit, we enjoy a more civilized meal around the table. This year I decided to serve an Italian brunch in honor of my Italian mother, with Uova al Purgatorio, or Eggs in Purgatory, as the star. Oven-poached eggs over a rich and spicy sauce of tomatoes, artichoke hearts, salty capers, and hearty Yukon Gold potatoes, this was a perfect dish for our Sunday brunch! I also think the name is deliciously ironic given the joys and--ahem--challenges of motherhood. What makes me even more excited about Uova al Purgatorio is that most of the preparation work can be finished ahead of time. You can make the entire sauce the day before (in fact, I think it actually develops a richer flavor if it's made in advance and then reheated), which means this is an easy meal to serve when you're entertaining or if you simply want a relaxing brunch on your own! While the original recipe (from Bon Appetit) suggests serving the dish family-style, I had a lot of fun plating the servings up individually and garnishing each plate with bunches of fresh thyme from my garden, which I totally recommend for a little extra wow-factor. You'll also want to serve this with plenty of ciabatta bread (or other rustic loaf) to sop up the delicious juices that run out from the sauce! Heat olive oil in heavy large skillet over medium heat. Add chopped onion, chopped thyme, and crushed red pepper; sprinkle lightly with coarse kosher salt and sauté until onion is tender and golden brown, about 10 minutes. Add artichokes, garlic, diced tomatoes with juice, and tomato puree and gently stir to combine. Bring to boil, then reduce heat; cover skillet and simmer 15 minutes to allow flavors to blend. Preheat oven to 375°F. 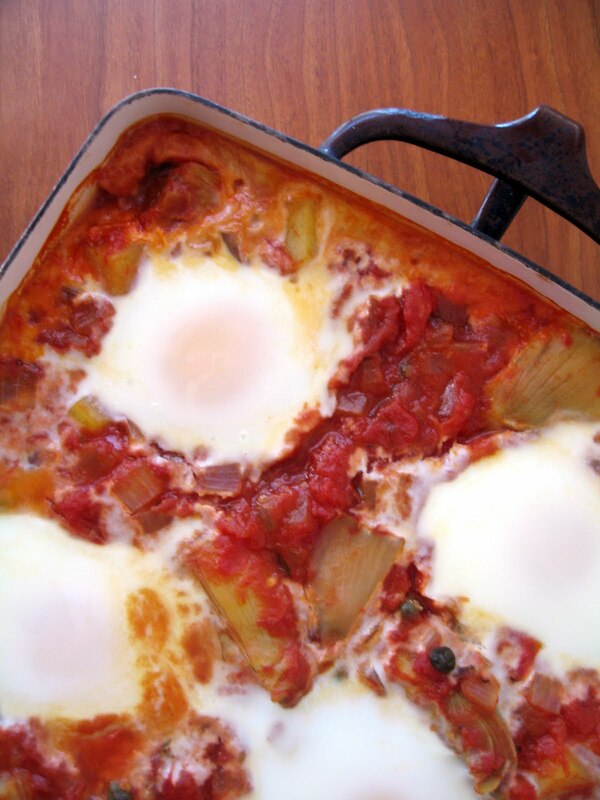 Pour tomato-artichoke sauce into a 9 x 13 x 2-inch baking dish. Using back of spoon, make 8 evenly-spaced indentations in sauce for holding eggs. Crack 1 egg into each indentation in sauce (some of eggs may run together slightly in spots). Bake until egg whites and yolks are softly set, 12 to 20 minutes, depending on the starting temperature of the eggs. Serve with a sprinkling of grated Parmigiano and plenty of ciabatta bread. 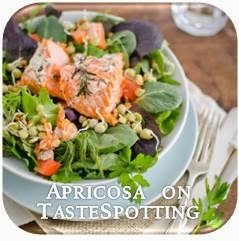 If plating individual portions, garnish with sprigs of fresh thyme. I love making meals for my family on special occasions as well. I'm sure your mother felt blessed. What a delightful post and recipe. Thank you for sharing! well, i know this kind of preparation although before commenting your post i had to check what "purgatory" means! Now I know, and you are absolutely right ! 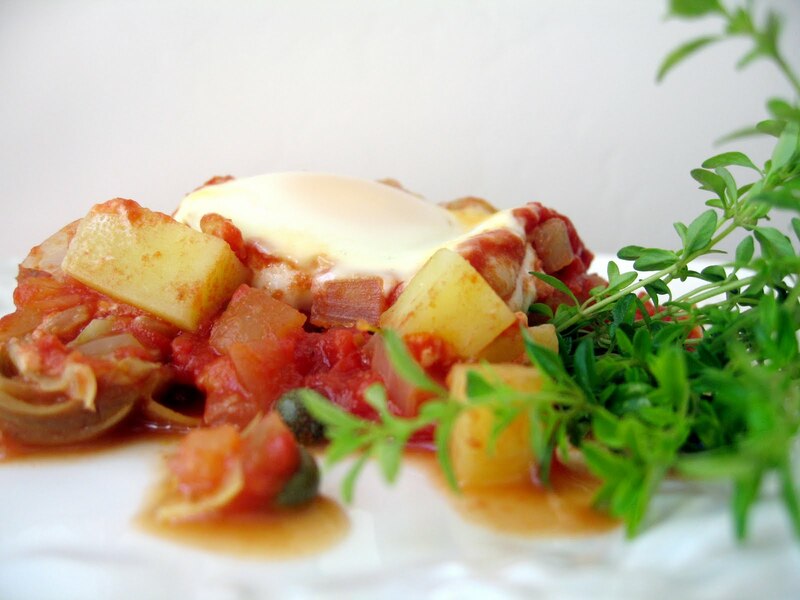 Do you know eggs "a la bourgogne" ? Meaning, eggs in red wine and shallots ? I love Italian food and this recipe sounds amazing. I'm very excited to try it out this weekend when I'm having some people over for brunch! Thanks everyone for the nice comments! :) So happy you stopped by to visit Apricosa. This is definitely a tasty, feel-good recipe that I hope you all can enjoy sometime soon! 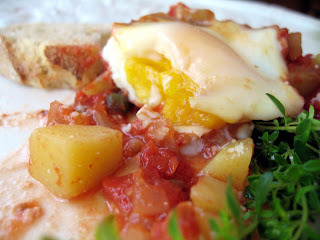 Magdalena, I am really interested in the idea of eggs a la bourgogne...do you have a recipe for it? 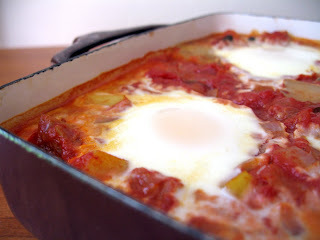 eggs in purgatory! wow thats an awesome name :)) the recipe sounds soo delicious!